Galveston Texas Beach House Rentals. 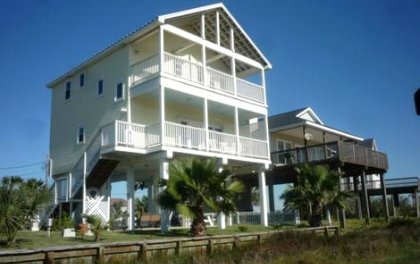 Experience the unique Galveston Texas Beach House Rentals near the Galveston Beach Pocket 2. 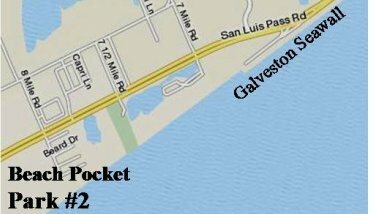 The rentals are close to the beach on "8 Mile Rd", about a mile from the western end of the Galveston wall. 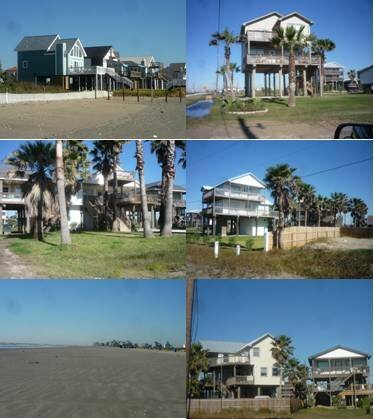 The Galveston beach front rentals are a little community on their own and quite secluded from other rental facilities. What makes it a very unique place is it absolute quietness. The rentals are nice and neat but very moderate. Most of the houses are on standing pillars with big parking spaces available. Rental rate over here are much lower than those along the seawall. Most of them are owned by individuals. The access road is not paved. That is the only drawback. Unless it rains, this will be an excellent Galveston beach rental location for family vacations and group parties without being disturbed. .
Access to the wide and sparsely used beach is perfect. Some fishermen believe the waters here are great for fishing so come along with some fishing rods. Looking for Galveston things to do shouldn't take long. The island is not that big. The Galveston State Park is nearby and restaurants are all over the city. As a matter of fact Woody's restaurant and Cafe Michael Burger are 2 minutes drive from the beach house rentals here. Below are some extra photos and a map area of the Beach Pocket #2.